Lagos – January 02, 2019. The Nigerian Stock Exchange (“the Exchange” or “NSE”), a multi asset exchange & index provider, and Afrinvest Securities Limited (“ASL”), a leading capital market research and securities execution platform, are pleased to announce the launch of two new factor indices: the NSE-Afrinvest Banking Value Index (NSE-Afr BVI) and NSE-Afrinvest High Dividend Yield Index (NSE-Afr HDYI). The indices will be available real-time on both NSE and Afrinvest WA websites from Thursday, January 03, 2019. 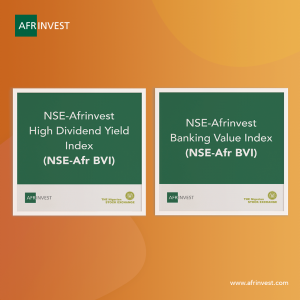 NSE-Afr BVI and NSE-Afr HDYI were designed in response to requests for applicable benchmarks for measuring value in banking stocks and high dividend stocks listed on the Exchange. They will serve as tools for investment managers and corporate treasuries seeking appropriate benchmarks to evaluate the performance of their portfolios to a segment of the banking sector or high dividend orientation as applicable. The indices can also be used as the performance target in index-replicating financial products such as Exchange Traded Funds and Derivatives. On the launch of the indices, the Chief Executive Officer of the Exchange, Mr. Oscar N. Onyema, OON, remarked, “In view of rising demand for financial products that adequately meet the needs of market participants, particularly investors, the Exchange is pleased to collaborate with Afrinvest West Africa on these novel index strategies. The indices consider the fundamentals of underlying securities. We commend Afrinvest for its product innovation and for leveraging the Exchange’s Index calculation and management expertise”. “The Exchange is committed to driving sustainability of our marketplace and supporting investable product creation endeavours by stakeholders to enhance the depth of the market. We will continue to welcome innovative solutions to identifiable gaps in the capital market”. Mr. Ike Chioke, Group Managing Director, Afrinvest West Africa, also said “Afrinvest West Africa is proud and excited at the rollout of the new indices in collaboration with The Nigerian Stock Exchange. It is our belief that this partnership will serve as a veritable proponent for more forward-thinking initiatives meeting market needs. On the back of these indices, investors will now enjoy the benefits of proxies that seek out dividend paying stocks and value oriented banking stocks listed in Nigeria”. The NSE-Afr BVI and the NSE-Afr HDYI as with all other NSE indices, will align with the NSE’s Index committee’s governance standards. Guidelines and methodologies for the indices are publicly available on the NSE and Afrinvest’s website.